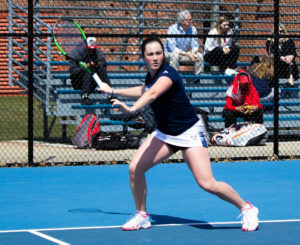 Following a 6-1 win on Senior Day, the Quinnipiac women’s tennis team (7-12, 3-0 MAAC) cruised to another 6-1 victory, this time over the shorthanded Saint Francis Red Flash (3-16, 2-2 NEC) on Sunday in Hamden. Quinnipiac began the day with an advantage over Saint Francis as the Red Flash only had five players available. With that said, there were only two doubles matches, and the Bobcats only needed to win one to secure the point. The Bobcats split the doubles matches with the Red Flash but earned a point since the Red Flash were short handed. Sophomore Dominique Vasile and senior Proyfon Lohaphasian teamed up to win another No. 1 doubles 6-4. This win improves the duo’s record to 8-5 on the season. For No. 2 doubles, freshman Kamilla Nella and sophomore Payton Bradley lost 6-4. The lone doubles loss proved to be the first of two losses on the day for the Bobcats. They marched into singles matches up 2-0 due to a default No. 6 singles victory. Bradley kicked off singles play with a 4-1 victory over Saint Francis senior Raksha Bode. Nella clinched the Bobcats’ seventh win of the season after winning in straight sets against Saint Francis junior Lucia Seigford. With that win, Nella earned her 12th singles win, tying her with sophomore Courtney Nash for the most on the team. Miller has been pleased with her play thus far, especially since she’s the lone freshman on the team. Sophomore Stephanie Yanosov and senior Jennifer Lu won No. 5 and No.1 singles, respectively, while Lohaphasian lost No. 4 singles in a hard-fought match 2-6, 7-6 (3), 10-4. Quinnipiac has a few days to rest as the next match is against Bryant on Thursday April 11 in Hamden.